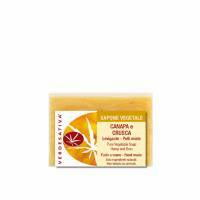 The Verdesativa Hemp and Bran soap is specific for combination skin. 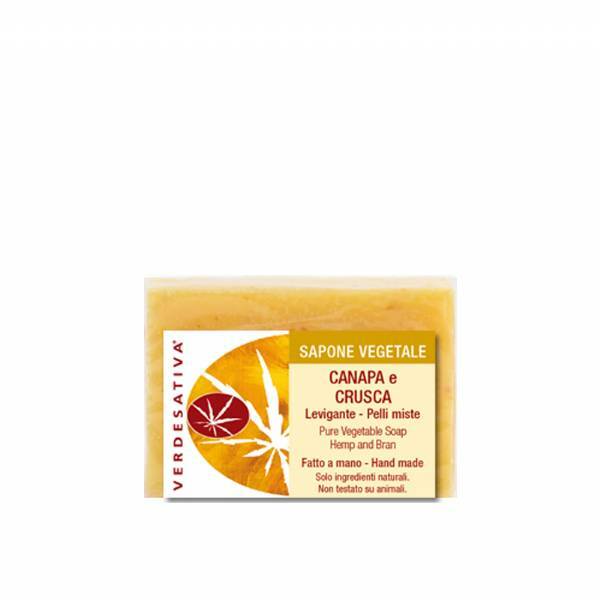 Verdesativa soaps are completely natural and are produced using the traditional method of the dough cold. The fatty acids from Cannabis oil and Coconut oil contribute conditioning silky feel, moisturizing soaps, a large amount glycerin is formed spontaneously during the process which makes soaps creamy and gentle on the skin. The Verdesativa hand-cut soaps requires a quite long cure time, in order to allow the pH changes slightly over time. With the resulting soaps which providing natural defenses of the skin without modifying physiological pH. The pH will change slightly over time, with the resulting bar imparting a more gentle feeling to the skin. Pleaseant fragrances and colours are derived from pure essential oils and plant extracts, doesn't contain sequestrants, preservatives, dyes or synthetic fragrances. They are hand-cut and packed with care and passion, definitely the best alternative and natural products for dailycare. Ingredients (INCI): sodium cocoate, potassium cocoate, glycerin, aqua, cannabis sativa, cananga odorata, turmeric longa, benzyl benzoate, linalool, benzyl salicylate.